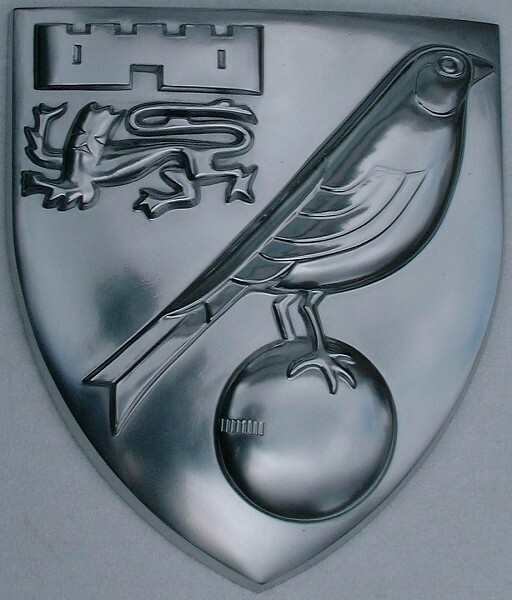 Norwich City Football Club shield. The visual impact of a sign or symbol is a powerful thing. Vital in the days when few could read and write, they are still extremely valuable in terms of instant brand or product recognition. The pictorial trademarks and corporate logos fiercely guarded by so many companies testify to that. 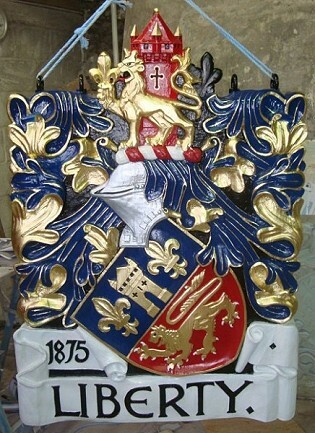 Sometimes these feature coats of arms, wholly or in part. Others use a design based on the name of the company. They can be extremely simple or very decorative. All however can be represented in ways other than a flat, two-dimensional drawing or pictorial signage. 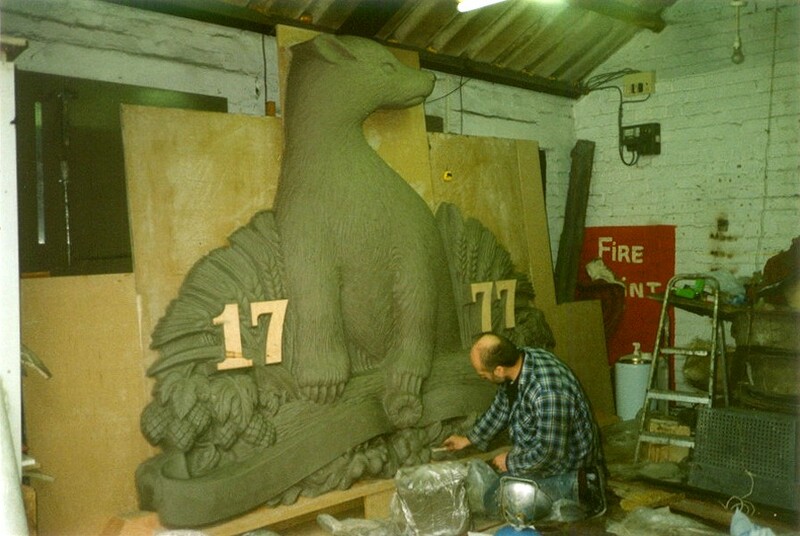 Partial or complete logos and trademarks can be reproduced as freestanding sculptures used for decoration on offices or business premises, or as plaques for award and signage purposes. 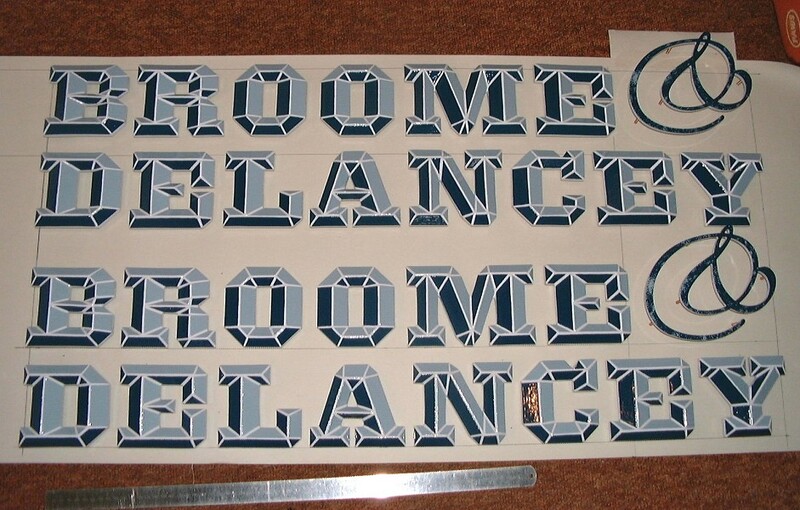 Working on one of the Euro Disney Theme Park signs. 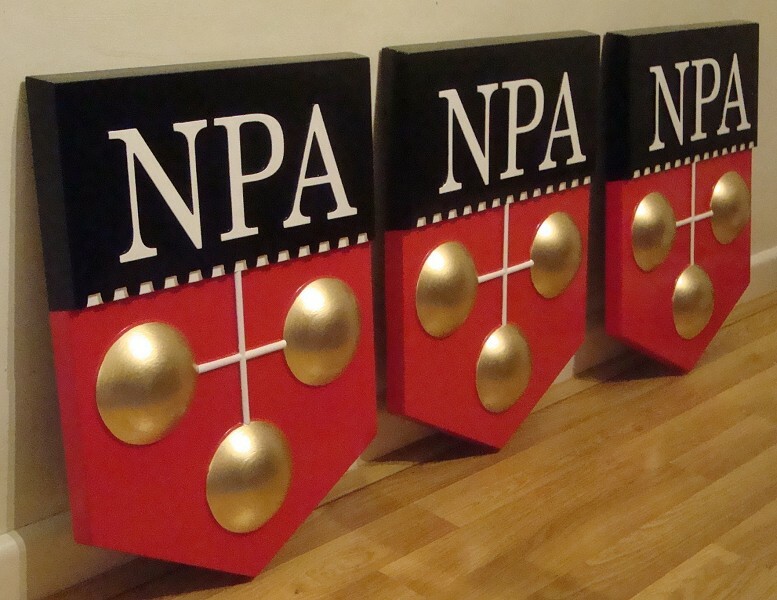 We are often commissioned by sign companies to undertake the more elaborate and decorative forms of signage to complement their usual sign work. 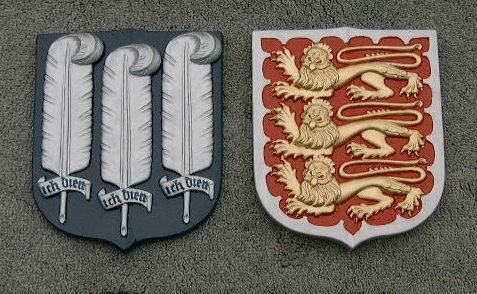 Our heraldry work is also often required to accompany court signage or government projects. The picture to the left shows work being carried out on one of a number of products that we undertook for several different sign companies for use at the Euro Disney Theme Park. 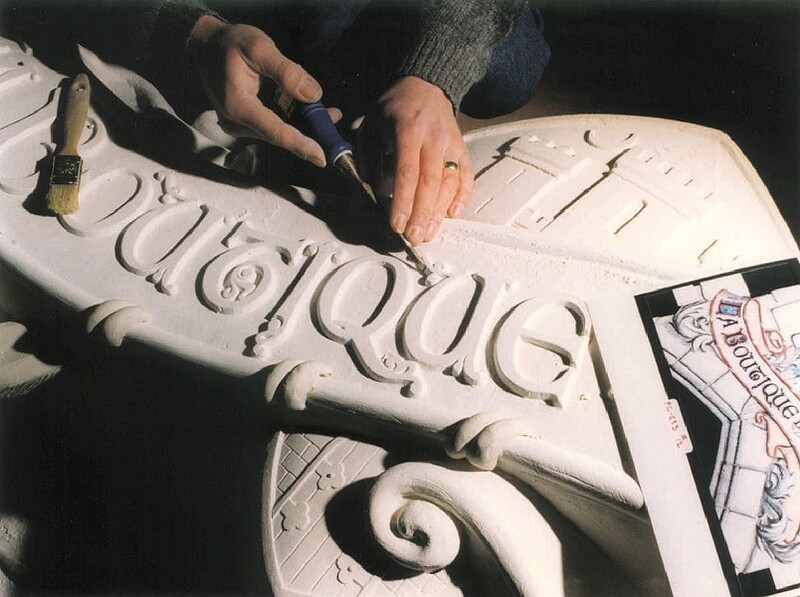 We make all kinds, sizes and quantities of emblems, sculptural signage, corporate logos and trademarks in a variety of materials from GRP (fibreglass) to cast bronze. 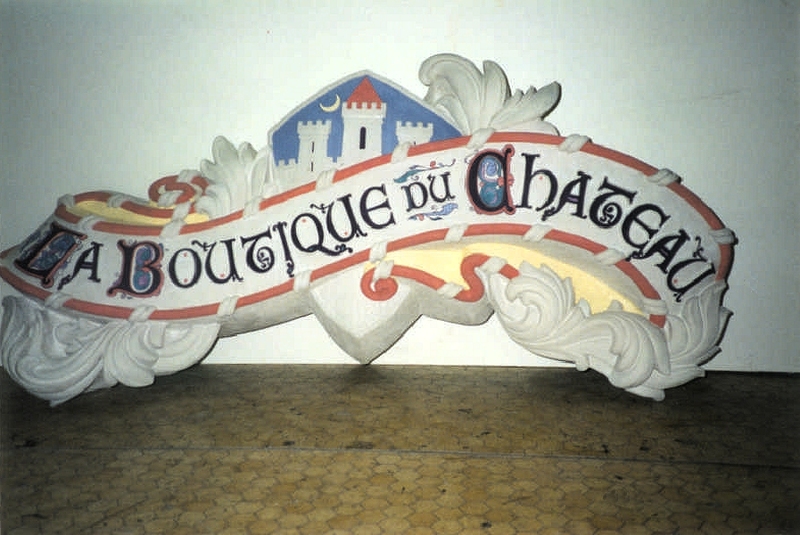 Finished Euro Disney Theme Park sign. 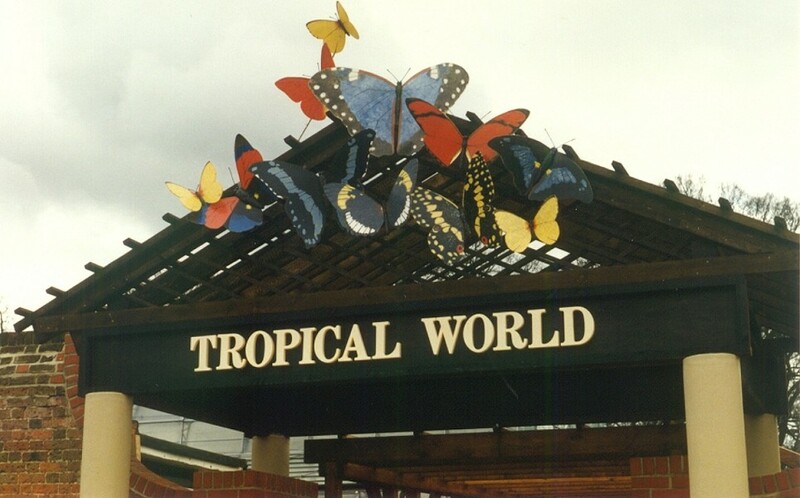 Giant tropical butterflies, Windsor Safari Park. 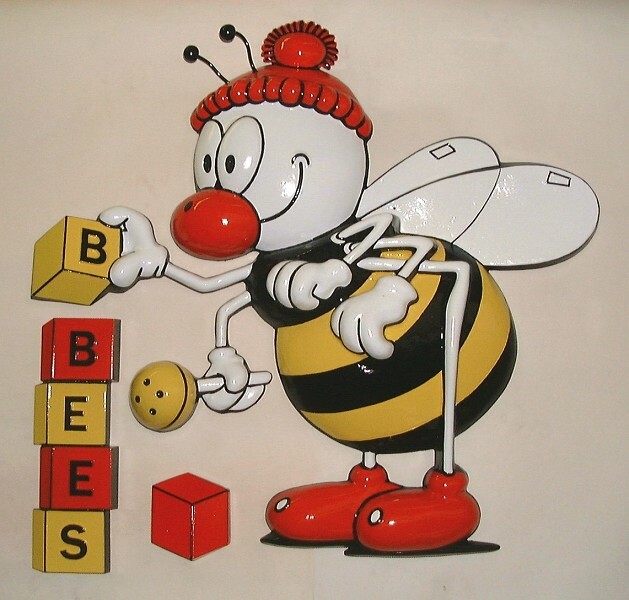 Emblem for Busy Bees nurseries. 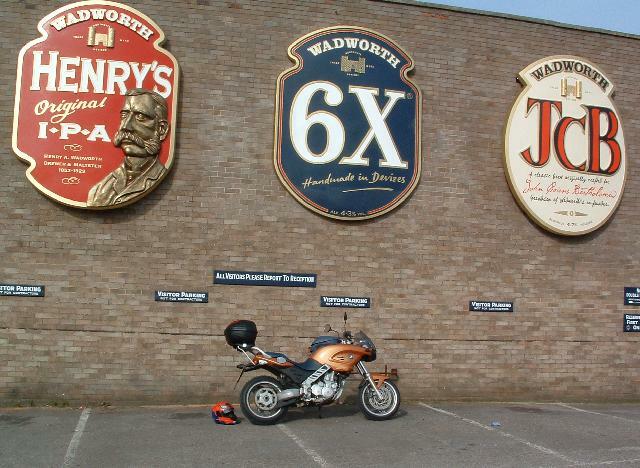 A set of three 10 foot high 'pump clip' plaques for Wadworth's Brewery. 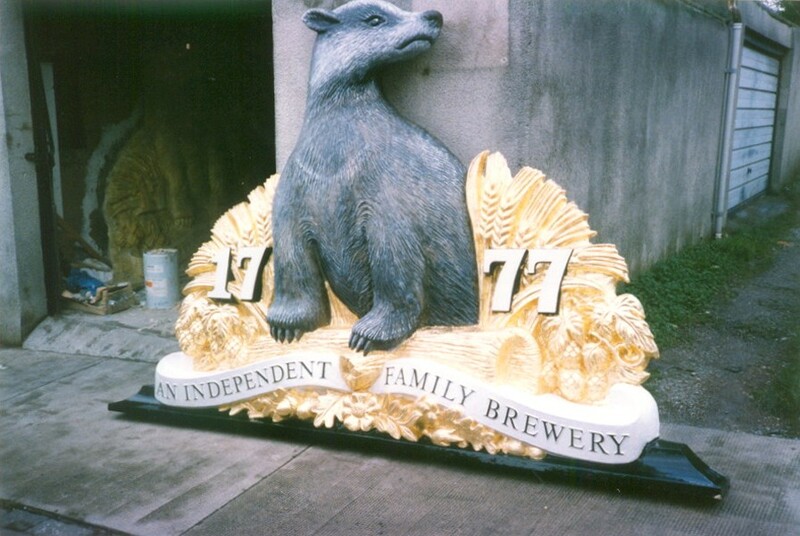 A large part of our work is manufacturing relief sculptured promotional plaques for breweries and distilleries. This is sometimes heraldry, but more often 3D interpretations of the brewery's product identity design for point-of-sale displays, or plaques for display inside or outside pub or restaurant premises. 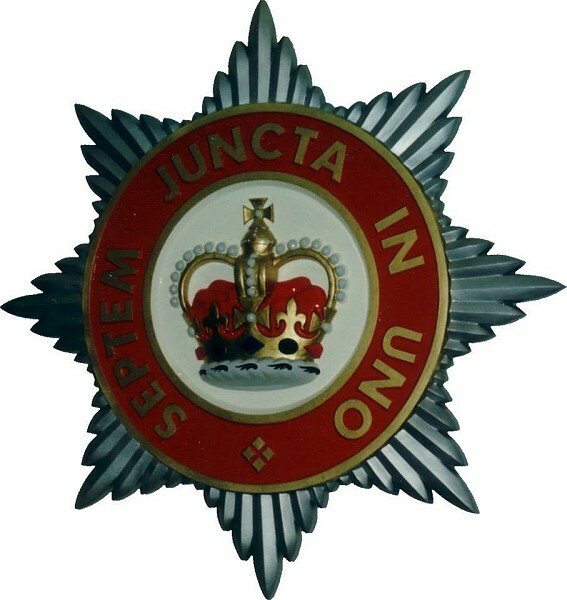 Our work comes in all shapes and sizes. 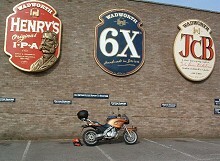 To the left is a picture of three plaques made for Wadworth's Brewery. 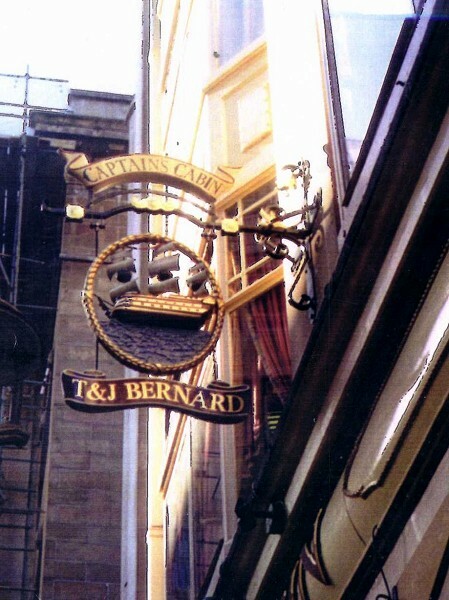 They are giant 10-foot-tall versions of the beer 'pump clips', curved like their smaller counterparts. Making the Badger Ales sign. 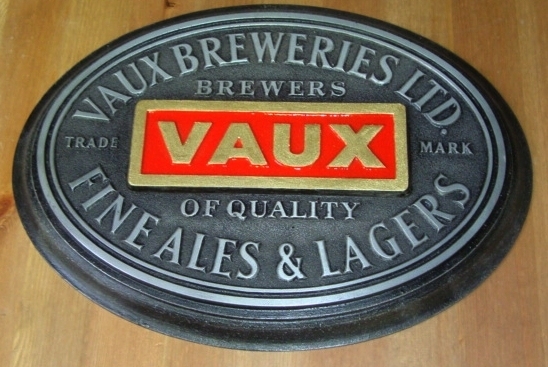 Plaque made for Vaux Breweries Ltd.
We create coats of arms, shields, badges and logos for universities, colleges, institutions, schools and military purposes, using a variety of materials and techniques. 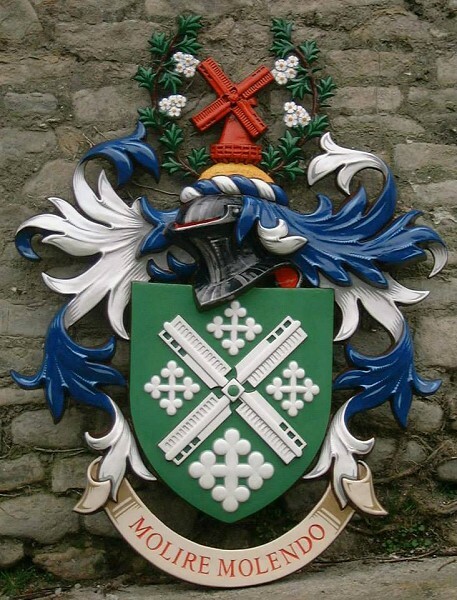 Liverpool Hope University coat of arms. 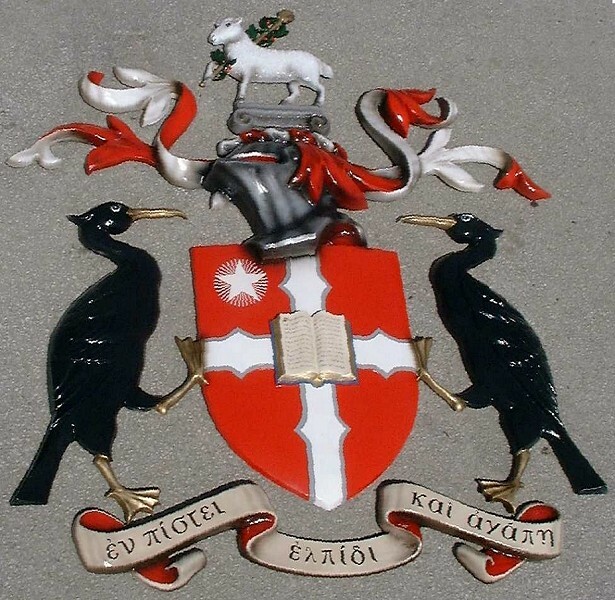 Millfield School coat of arms. Heathfield School logo in shaped stainless steel. 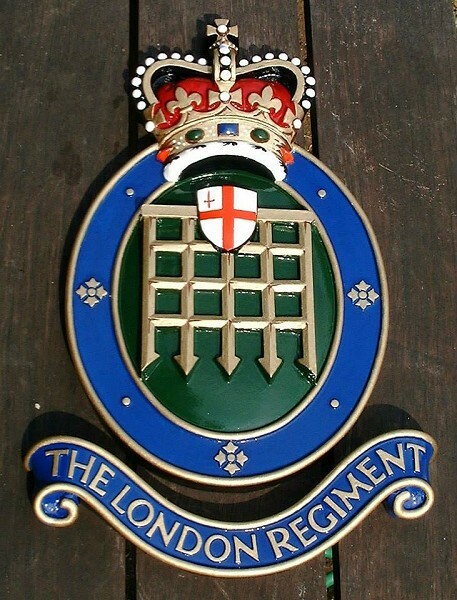 The London Regiment badge, London Guildhall. 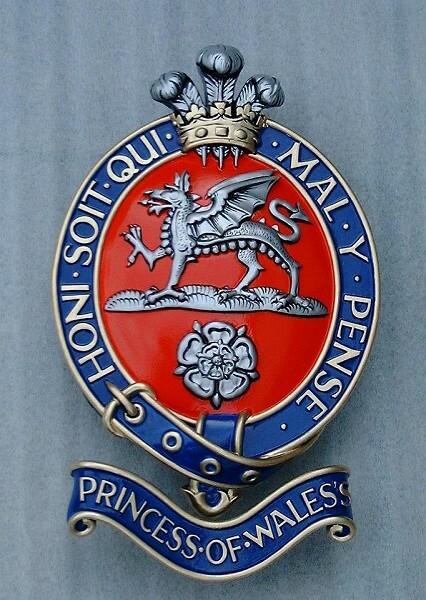 Princess of Wales's Regiment badge, London Guildhall. 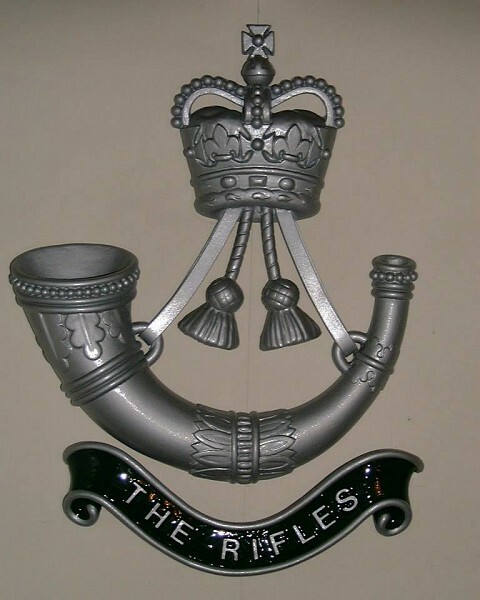 The Rifles Regiment badge, London Guildhall. Liberty sign moulded from one of their original ones and painted to look the same. 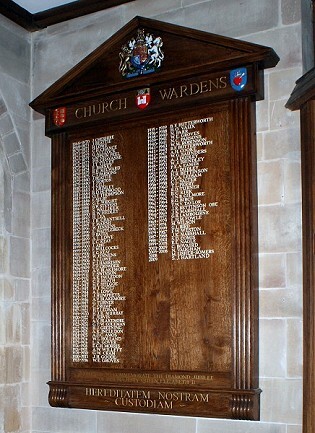 It's about 5ft high and extremely heavy, solid cast resin with a stainless steel support framework moulded in. A large, solid oak, carved and inscribed board for a church, listing past Church Wardens. 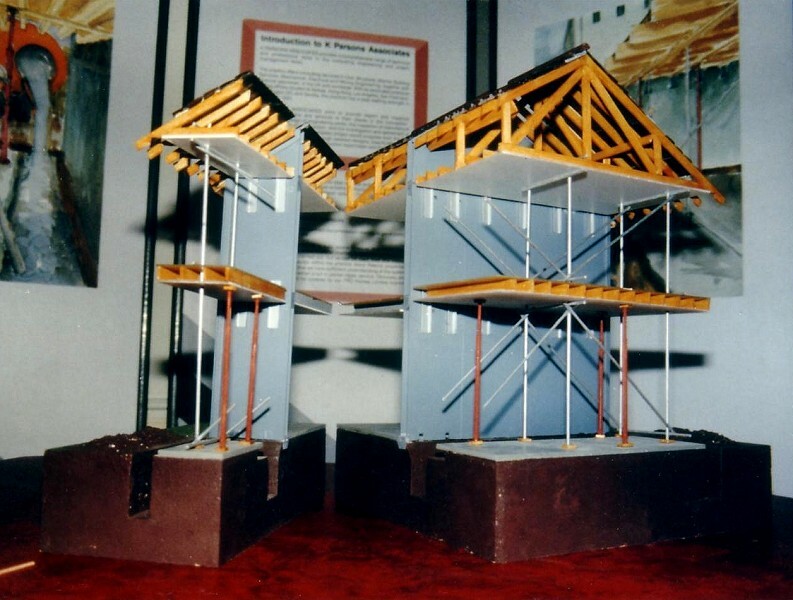 Our design and production facilities are very versatile and have included exhibition displays (see above), architectural ornaments and features, technical models (see below), theme park features and commemorative paperweights. 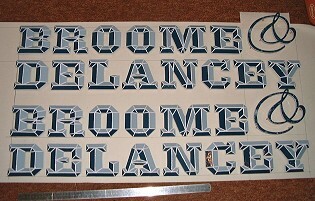 Lettering for Broome & Delancey restaurant, London. 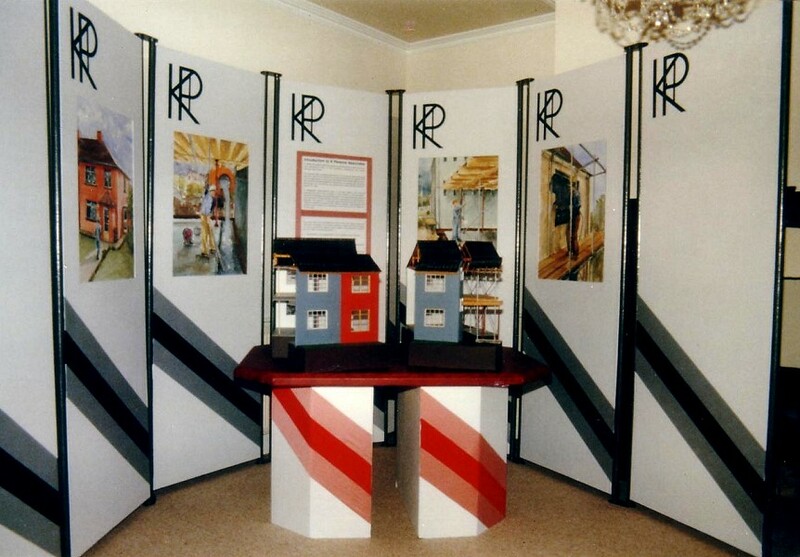 Bryan Rawlings Design, 14 Brookleaze, Stockwood Vale, Keynsham, Bristol, BS31 2AL, United Kingdom.